During its 141-year-long history, The Fiji Times has changed hands at least five times and has been none the worse for it. Each new owner infused it with fresh ideas and better resources to ensure its continued growth and expansion. The history of The Fiji Times is replete with examples of creativity and innovation, boldness and daring and a spirit of optimism and national pride. It has always embraced the future with hope and confidence and as such has carved an honourable place as an observer and recorder of the unfolding chapters of our history spanning three centuries. And so it will continue. It was in the dim past - on Saturday, September 4, 1869 - when the first issue of The Fiji Times appeared in that wild and lawless seaport, Levuka. It was launched by London-born George Littleton Griffiths and his wife who landed in Levuka after having lived in New Zealand for a while. This gives us a clue to the boisterous and drunken lifestyle that was pervasive in the seedy little town. Levuka was still a frontier town where buccaneers, fugitives, adventurers and carpetbaggers from different corners of the globe converged in quest of fun, fame and fortune. There was no law and order or organised government in those days and The Fiji Times was among the first to raise its voice to galvanise the community into bringing a semblance of peace, order and some form of government. Several attempts were made to establish a government but all failed because of competing interests and internal feuding. When King Cakobau finally decided to cede Fiji to Queen Victoria five years later year, The Fiji Times was there to record the momentous event of the signing of the Deed of Cession at Nasova in the old capital on October 10, 1874. And ever since, The Fiji Times has been present at every significant event to record it and present it to the public at large. With the reins of power now officially in British hands, Suva became the colony’s new capital in 1882. This led to a steady decline of Levuka and The Fiji Times could not survive in a town with failing businesses and diminishing population. Fortunately, it was acquired by a prominent Suva businessman, Sir Alport Barker, who merged it with his The Herald. The new entity continued publishing as a broadsheet under The Fiji Times & Herald masthead. The Barker company had a bigger and better printing plant and a few competent journalists. The afternoon daily had a limited circulation mainly in the city but as time passed, it expanded and gradually became a national paper. But bigger things were in store for it. In the early 1960s, the paper changed hands yet once again. A courtly gentleman of the old school with enormous experience in the publishing and printing industry in Australia bought out The Fiji Times & Herald from the Barker family. The new owner, Robbie Robson, set about transforming the paper into a proper professionally produced daily. He enticed Sir Len Usher, who was the government’s public relations officer, to take up the twin responsibilities of editorship and corporate management. Usher had come to Fiji as headmaster of Levuka Public School and later was appointed to head the government’s public relations department during the World War Two period. Robson’s intervention gave the paper its present identity. He renamed it The Fiji Times and turned it into a morning daily. He opted for a tabloid-type format. A network of newsagents was established to give it a wider circulation. Usher was instrumental in recruiting experienced and competent journalists from abroad while, at the same time, local people were taken on for cadetship training. Usher was a controversial editor because of his strong pro-establishment stance. He was an ardent supporter of Fiji’s links with the British Crown and maintained a regular correspondence with the secretariat at Buckingham Palace. Although his editorial comments were often provocative and polarising, they were eminently readable because of their literary elegance. It has become fashionable to denigrate expatriate journalists. Their contribution to The Fiji Times cannot be overlooked. They passed on their skills to local staff. Most of them were professional people who shared their knowledge unstintingly with the local staff. Many chose to remain in Fiji permanently. With Usher at the helm, the company began a programme of upgrading equipment. The old printing press was junked and a new – and the first in Fiji – modern and fast offset plant was installed. It not only drastically reduced the printing time but also produced clearer and sharper pictures and printed pages. The Fiji Times no longer runs a commercial printing division but until recently it had a thriving printing business. It was also a training ground for printers, bookbinders, rubberstamp makers, artists and designers. Some of the best printers in Fiji received their training at The Fiji Times on the job from a few master printers from abroad. In the early 1970s, The Fiji Times was a highly successful and profitable enterprise and hence ripe for a raid by a bigger company. In stepped the Melbourne-based Herald & Weekly Times group, at that time Australia’s largest media company. Robson decided to sell his holding company, Pacific Publications, which had its headquarters in Sydney. The Fiji Times was part of that business and proved rich pickings for the Herald Group. Together with the newspaper, the new owners also acquired the Sydney-based newsmagazine Pacific Islands Monthly. PIM was the first such magazine covering the South Pacific and had a loyal readership spread over the world. But the Melbourne Group was solely interested in the lucrative Fiji paper and, sadly, let the iconic magazine wither and die on the vine. Under this new management, the paper was fortunate to have as managing director a journalist with impeccable credentials who brought fresh ideas on news coverage, design and promotions. Dallas Swinstead, a veteran of the Melbourne Herald editorial team, introduced Fiji Sixes, a Lotto-type game that attracted wide public participation. As sales of the paper rose, so did its revenue. A separate charitable trust fund was created and hundreds of thousands of dollars were handed out to deserving institutions over ensuing years. Swinstead focused on community activities under Times sponsorship. One of his biggest successes was the Fiji Times Fun Run in which hundreds of people participated annually. These initiatives helped to boost sales and lifted the public profile of the paper. Just as the Melbourne Group was consolidating its position in Suva, another predatory shark – a white pointer this time – was encircling The Herald & Weekly Times. News Ltd supremo Ruper Murdoch had long coveted the Herald masthead and its assets. He made a strong and a somewhat hostile bid which the Herald was powerless to stop. It was a major coup for Murdoch who ended up with a huge newspaper chain that had a presence in all major Australian cities, Papua New Guinea and Fiji. The Fiji Times was a small jewel in his crown of which, incidentally, he was particularly fond because it was “the first newspaper published in the world each day”. The Fiji Times made this claim on reasonable grounds because of Suva’s location just east of the International Dateline where the new day begins. News Ltd could claim, with some justification that not only did the sun rise first on it but that it also never set on its global empire. The Fiji Times benefited enormously from this ownership change. After the 1987 military coup, News Ltd sent one of top troubleshooters, Geoff Hussey, to take charge as MD during a turbulent and volatile period. Despite the uncertainties prevailing then, Hussey began a major modernisation and acquisition programme. A state-of-the-art computer system was introduced in the newsroom which too was remodelled and refurbished. The vast news resources of a global media empire became just a computer key-lick away. The staff enjoyed better salaries and working conditions. He took advantage of a slump in property prices and bought two valuable adjacent properties – one a double storey structure facing Victoria Parade – and a residential property in Tamavua. Murdoch himself visited Suva in 1987 – soon after Sitiveni Rabuka’s military coup – to inspect his acquisition and assess the political situation as well. He was accorded a ceremonial welcome and mixed with the staff informally. And now, The Fiji Times finds itself in the hands of a yet another new owner – the locally owned Motibhai Group. This government-enforced sale comes at a critical time. The government has imposed a censorship regime on all media. The Fiji Times has been singled out for special punitive action as it has been deprived of all advertising from the government and its statutory bodies. Mahendra Motibhai Patel, the chief executive of the Motibhai Group, faces the daunting task of mending fences with the government. He must contend with declining advertising revenue, dwindling readership and the attendant ills of censorship. Declining readership is partly due to the censorship restrictions but it is a general world-wide trend. In this electronic era, young people are more at home getting their news from Blackberrys and computers. Patel has been on the board of The Fiji Times for more than 40 years and so would be familiar with both the prospects and pitfalls of running a media company. He is, however, a dynamic personality and an astute businessman. He will ensure good management for the company and is sufficiently enlightened to leave the editorial operation of the paper in the hands of journalists. He is, after all, inheriting not only an incredibly good newspaper but an institution that has played a crucial role in the history of Fiji. He has recalled his old friend Swinstead to take charge and one can be certain of some interesting changes. When there was no postal service in Fiji during the early days of The Fiji Times, some bright mind decided to use pigeons to carry despatches between Suva and Levuka. Patel will need similar ingenuity to take the paper to new heights. 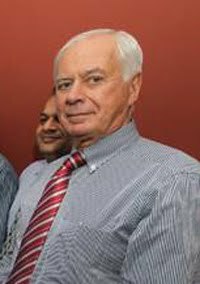 Vijendra Kumar was editor of The Fiji Times from 1975 to 1991 and resigned to take up a position at The Courier-Mail in Brisbane where he now lives in retirement. 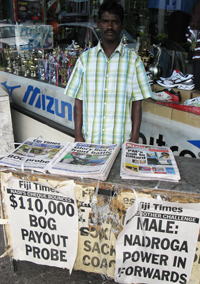 Pictured from top right: A Fiji Times newspaper vendor (Photo: David Robie/PMC); Dallas Swinstead (Photo: Fiji Times); and the enforced sale of The Fiji Times (Photo: David Robie/PMC).